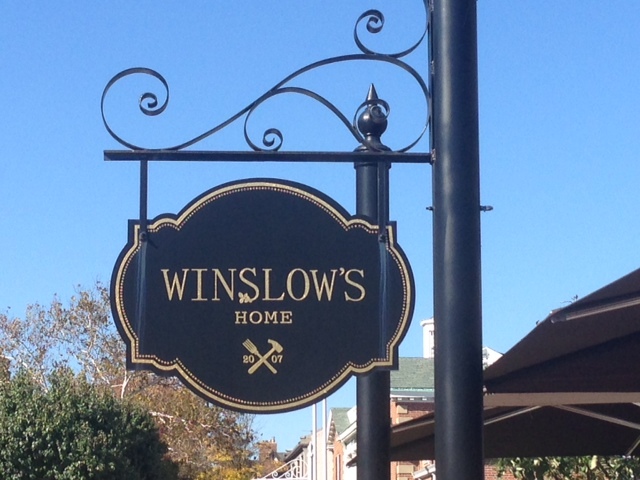 Winslow’s Home is what I would consider to be the hidden gem of University City. If you are not looking for this restaurant as you drive down Delmar Blvd., you are likely to miss it as the building’s architecture blends right into the rest of the neighborhood. The farm-to-table concept is apparent from both the rustic and homey feel of the restaurant to the seasonal and ever changing menu. In fact, much of the food is grown right at Winslow’s Farm near Augusta, MO. Not only is Winslow’s a restaurant but it is also a store with a variety of household products, books, and local foods such as sweets, flavored salts, and honey. I would like to preface my review by saying that this is probably the fifth time I have dined at Winslow’s and I go back because I love it so much. However, my experience for brunch last weekend was incredibly different than what I am used to. Since it was a beautiful Fall morning and I live in the neighborhood, we decided to ride our bikes to the restaurant. There are two racks out front which made it easy to secure the bikes while we ate. It was a crowded Sunday morning as I expected and we took our spot in line to order. Diners have the option of any of the breakfast items, salads, main courses, and off-the-menu specials such as butternut squash soup throughout the day (See Winslow’s Seasonal Menu (PDF)). While standing in line to place our order, a hostess took our name and informed us that it would be quite a wait for outdoor seating so we settled on eating inside. After standing in the very slow moving line, we ordered and were then instructed to move to another line to pick up our drinks. 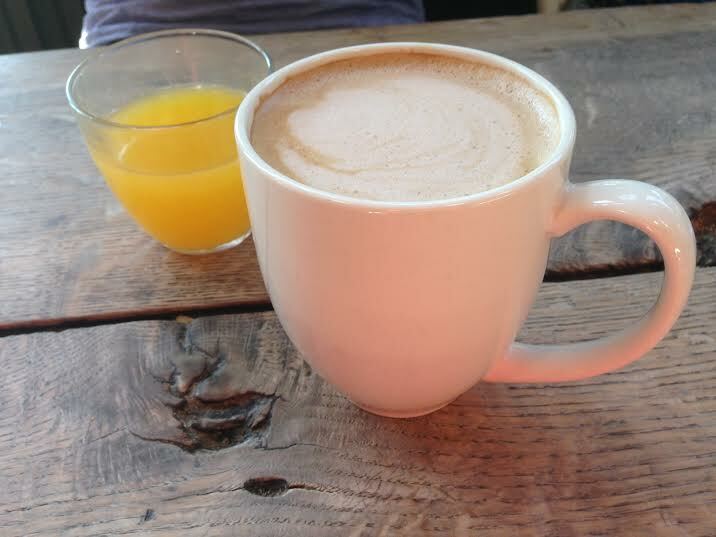 After sixteen minutes of waiting at the counter, I was handed a mocha and the smallest glass of fresh squeezed orange juice I have ever seen. Now I understand that the orange juice was fresh but had I known that it would be gone after four sips, I would have chosen something else, especially with how long I had to wait for it. After 25 minutes our food fi nally arrived. My husband went with the pork burrito which was a whole wheat tortilla stuffed with breakfast sausage, eggs, potatoes, cilantro, mozzarella, chipotle sour cream and served with a side of tomatillo salsa. The portion was quite large and the flavors were good. The burrito was a bit dry however the salsa took care of the problem. 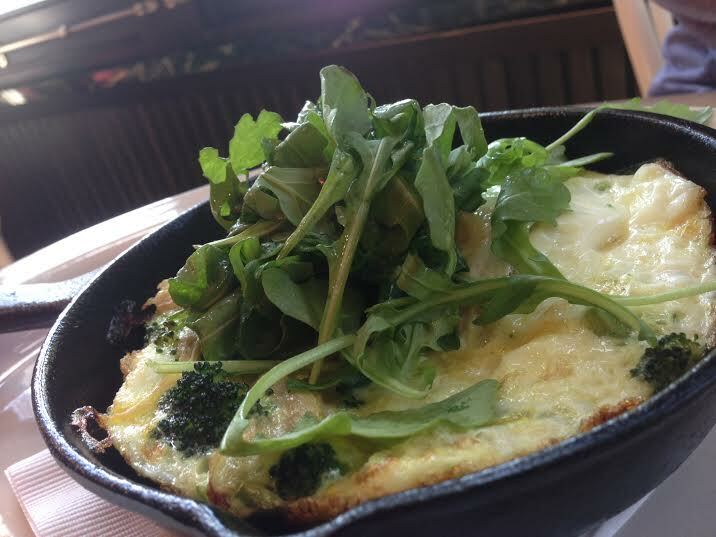 I ordered the egg white frittata which was mixed with broccoli, caramelized onions, cheddar cheese, and topped with arugula and served in a hot cast iron skillet. While the presentation was good, the bottom of the frittata was burned, rubbery, and required a knife to cut which is not what I expect in an egg dish. I was underwhelmed with my meal because it felt like it was something I could have made in my own kitchen. We finished our meal with a plum sour cream coffee cake which was large enough to share, very moist, not overly sweet, and reminded my husband of a Russian cake that his grandmother used to make. Overall, I was disappointed with my experience because of the wait times, chaotic atmosphere, and execution of my dish. Although the restaurant is designed to be cozy and quaint, it doesn’t feel equipped to handle a crowded Sunday morning. However, I have had really good experiences at this restaurant in the past and I am incredibly impressed with the freshness of the food and concept of the menu so I will definitely be back, maybe just for a mid-week, late afternoon lunch. Exciting things are happening in the Delmar Loop including the building of Wash U. student housing, the opening of exciting new restaurants, and the creation of a much needed grocery store. The owners of Global Foods Market in Kirkwood recently opened their newest venture, United Provisions. This specialty supermarket features items you would find in a typical American grocery store as well as products from around the world. Another component unique to this location is a restaurant called The Dining District, located inside United Provisions. Chef Ben Poremba, James Beard nominated chef and owner of Olio and Elaia, has partnered up as chef in this new venture. The Dining District offers a variety of foods including old favorites from Porembra’s other restaurants such as Olio’s egg salad and burrata as well as a huge menu of new creations. They feature a raw bar, a long list of sandwiches, grill items, and full sushi menu which is overseen by Chef Naomi Hamamura. I started my meal with two appetizers, the burrata and crudo. The burrata was topped with olive oil, salt, and pepper and served with beets on the side. It came with a large portion of warm pita bread although I was happy eating the dish on its own. The crudo included five thinly sliced pieces of fish that were also lightly seasoned with olive oil, salt, and pepper. I was a little nervous about ordering this on a Sunday night because it is hard to expect much freshness out of seafood at that time of the week. However, this fish was perfect and tasted like it was caught that morning! Next up was a marinated artichoke and provolone warm-pressed sandwich. It was filled with marinated artichokes that were just a little too lemony for my liking but delicious nonetheless. There was a thin layer of a mayo based spread over the bread which was crisp on the outside and soft in the middle. I’ll be honest, I didn’t finish the sandwich at the restaurant but ate the rest at home later that night. My husband ordered the goat burger which was a hamburger topped with a healthy serving of goat cheese and medjool date tampenade for sweetness. The burger was served medium rare and was devoured before I could even finish half of my sandwich. Because there was a sushi menu sitting in front of me the whole night, I couldn’t help but order one roll. I went with the Hamma’s tuna roll which is Chef Hamma’s signature spicy tuna roll. The tuna was incredibly fresh and the sauce was not overpowering as it sometimes is. The sushi was a bit more expensive than most restaurants in St. Louis with prices averaging $8.50 for basic rolls and $10 to $22 for specialty rolls. Somehow, I managed to save just a tiny bit of room for dessert. Desserts at the restaurant are provided by La Patisserie Chouquette and are displayed in a case at the front of the restaurant. 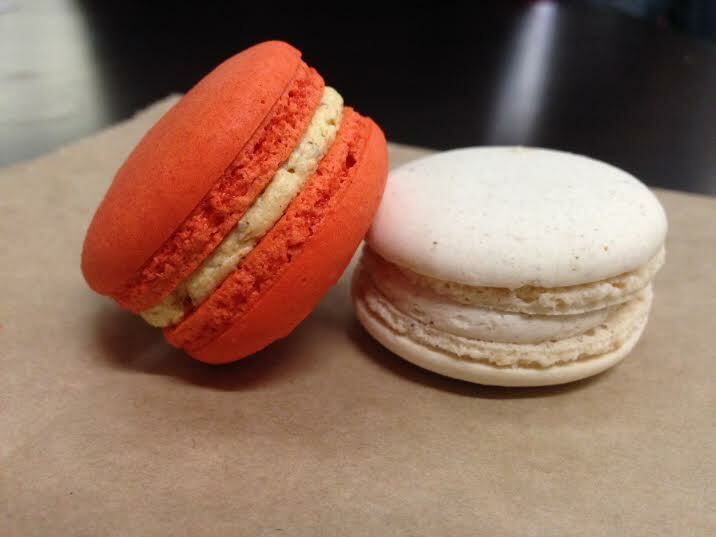 Since I had just eaten the equivalent of about three meals, I stuck to macarons. Although there were lots of interesting flavors such as absinthe and lavender, I chose to play it safe with pumpkin and chai. They were both fresh, delicious, and probably the best I have found in St. Louis. Overall, I was really impressed with both the grocery store and restaurant and I think that this space adds so much to The Loop. 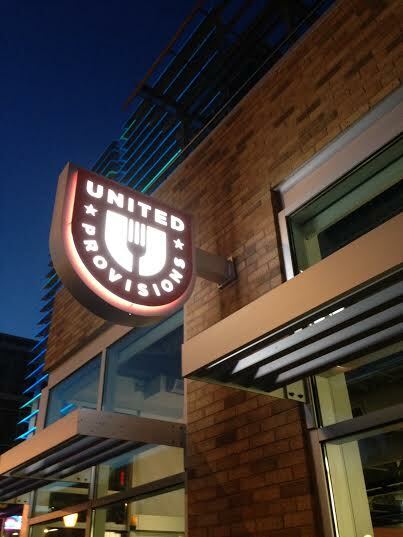 Whether you need groceries, takeout, a fast lunch, or want to sit and enjoy a nice meal with a bottle of wine, you will be able to find something at United Provisions and The Dining District that works for you.